Early STAR WARS Video Games | Warped Factor - Words in the Key of Geek. When Star Wars arrived in 1977 it revolutionised the world of science fiction/fantasy cinema thanks, in no small part, to its groundbreaking special effects produced by the fledgling Industrial Light and Magic. It was also a time when a revolution was beginning in the world of home entertainment. Board games were beginning to gather dust, and being replaced in favour by electronic video gaming, in a variety of forms. Fittingly then, Star Wars was there almost from the beginning. 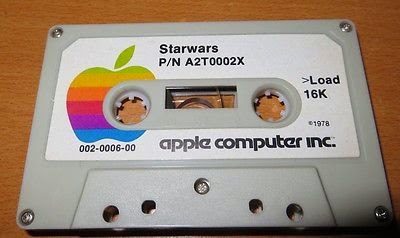 The very first game to carry the Star Wars name was released in 1978 by Apple Computer Inc. Given Apple's attitude towards protecting their own software it's surprising to learn that this game was totally unlicensed, and although the cover of the cassette tape may have carried the phrase 'Starwars', the gameplay itself was very much taken from the ideas presented in the movie. As a Rebel cadet, or "space pilot trainee", your mission was to fight off the hostile Imperials attacking the Star Base. TIE fighters appear on the first-person heads-up display, and using the revered controls you blast them to smithereens! Very basic, very simple, with the TIE fighter being the only moving sprite in the game. Also appearing in 1978 was the first actual Star Wars video game cartridge. 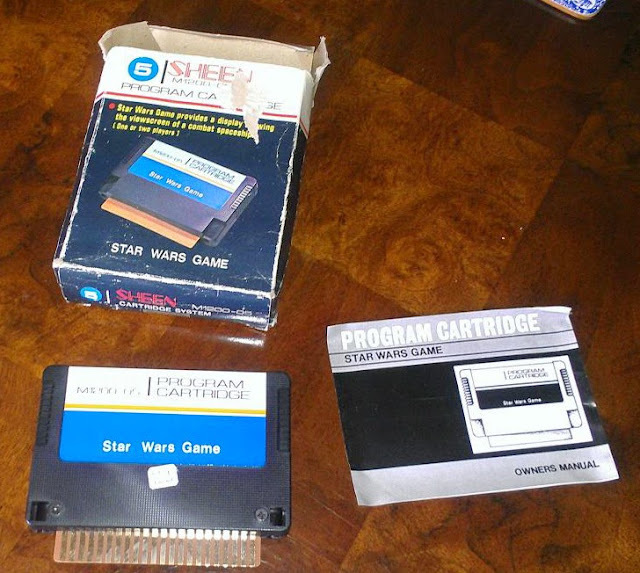 For use with the RCA Studio II clones Sheen M1200 and Mustang Telespiel Computer, the gameplay itself was very similar to Apple' Starwars, although even more basic in design. 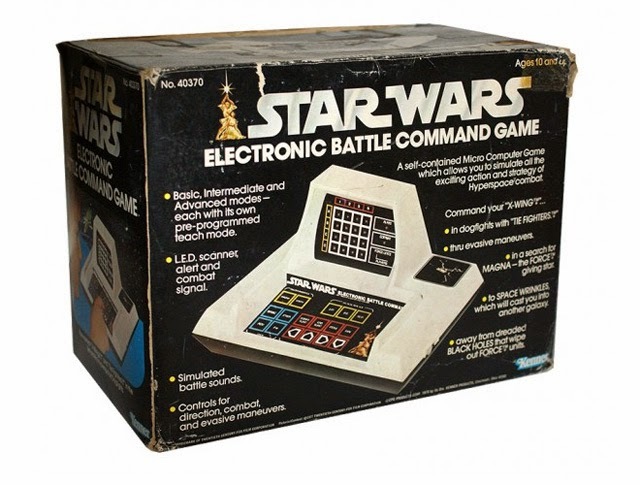 1979 would see the first officially licensed Star Wars electronic game, coming in the form of Kenner's table-top Star Wars Electronic Battle Command. Fire this baby up with 6 AA batteries and up to four players could enjoy taking turns scanning the LED coordinate grid and simulating all the exciting action and strategy of Hyperspace combat! Or that's what the box says anyway. The gameplay is really only loosely connected to Star Wars, and so the casing could've easily been swapped out for pretty much any other concept and still worked as an LED game, but there is one interesting thing to note about this product. Years before George Lucas came up with the whole midichlorians concept, Kenner had you searching for a star called Magna - their suggestion for where the Force came from. It would be 1982 before the first proper Star Wars video game would arrive. 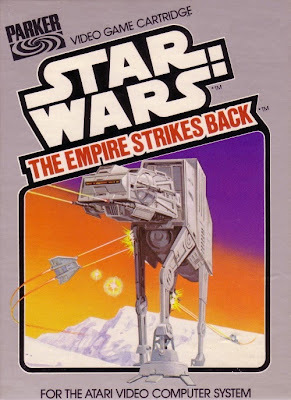 Released by Parker Brothers and debuting on the Atari 2600, The Empire Strikes Back allowed you to pilot a snowspeeder during the Battle of Hoth. The following year would see Parker Brothers return with two Star Wars titles. Firstly, Star Wars: Return of the Jedi - Death Star Battles. In the game, you control the Millennium Falcon with the aim of destroying the second Death Star as seen in the film. It was a quantum leap from the previous Star Wars game as there were actually different stages to tackle. In the first stage, you had to shoot enemy TIE fighters while waiting for an opportunity to pass through an energy shield. 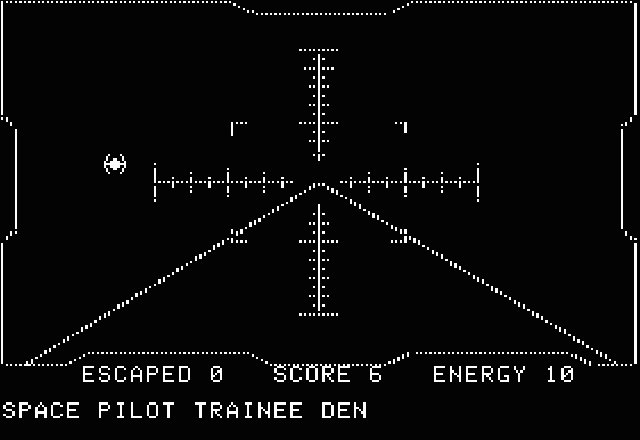 In the second stage, it was time to shoot at parts of the Death Star until you have a clear path to the reactor. But it wasn't over then, as once the reactor had been destroyed you had to survive the resultant explosion. 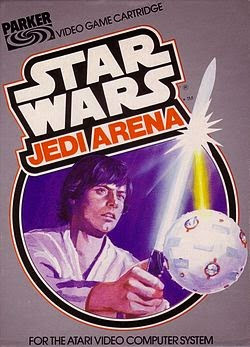 Next came Star Warw: Jedi Arena, which saw two Jedi Knights, one blue and one red, face each other during lightsaber training. Player one is always blue, and the red Jedi is either a human or computer controlled opponent. Clearly inspired by the scene from Star Wars: Episode IV - A New Hope where Luke trains with a Seeker ball, you control the lightsaber with the paddle controller, defending from the laser blasts coming from the Seeker ball. The Seeker will regularly go wild and fire laser blasts randomly. The aim of the game is to deflect laser blasts from the Seeker at the opponent's shield and finally the opponent himself. 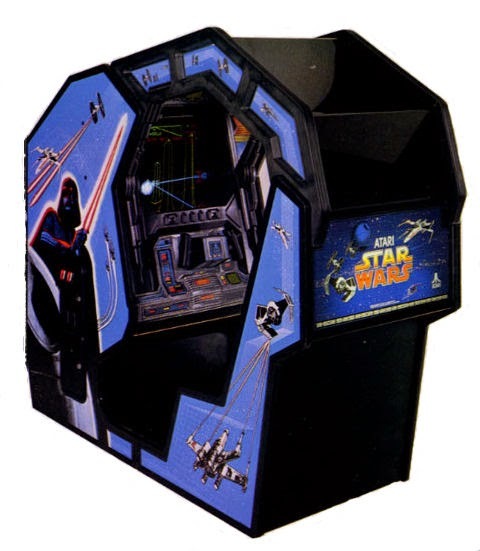 While Return of the Jedi had audiences queuing up at their local cinema, queues were also forming around the very first Star Wars video game to arrive in arcades. 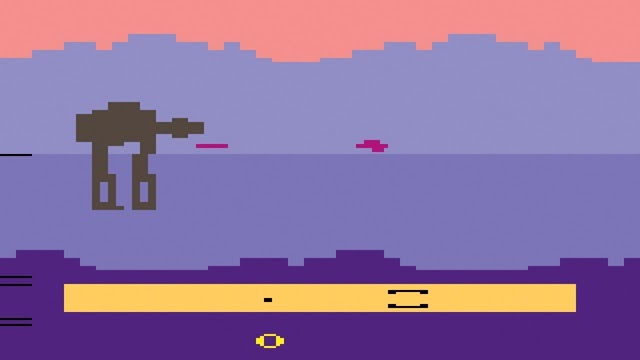 Released by Atari, and based around A New Hope, Star Wars featured color vector graphics and the first ever in-game use of digitised speech from a film. After entering the seat of Luke's Red Five X-Wing fighter, you could battle waves of TIE fighters led by Darth Vader, as the sound of the Imperial fleet zoomed across the stereo speaker system. It really was mightily impressive for the day. The next stage would see you weaving through towers across the surface of the Death Star, before plummeting through the battle station's trench in an attempt to destroy it. "Don't get cocky, kid". 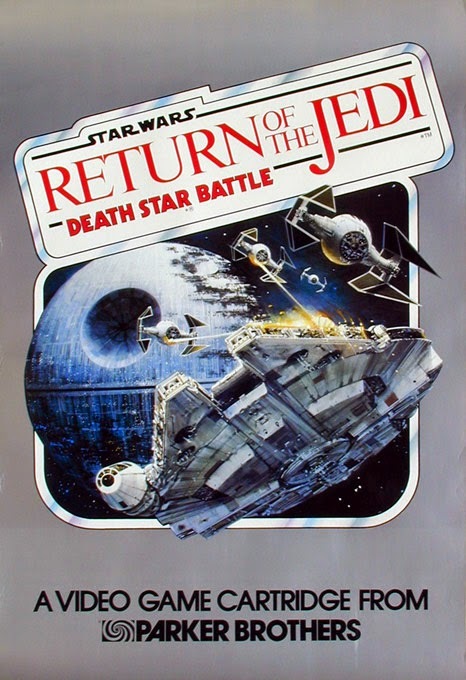 The sequel for the game, The Empire Strikes Back, used the same vector technology to re-create scenes from the second film, including battles with AT-AT walkers and an asteroid field. No further original Star Wars video games were produced until 1987, when Namco released a game for the Famicom (NES) exclusively in Japan. The West would have to wait until the early 90s for that, and a whole host of other Star Wars titles, which we explore in a later feature. "The Force is with you, always.."